The 3D Tic Tac Toe game I implemented on the OTHER-1 was a port from a reverse engineering effort I and a friend embarked on while college students "living" in the school's IBM 1620 (Model 1) computer lab in about 1966-7. I was a physics major with an electronics hobby, while my friend was also a physics major but without the hobby, so my initial interest in the IBM 1620 (wiki link) was with its construction and basic functionality - starting with the architecture and machine language, while my friend's was more practical, starting with FORTRAN and Assembly. The equipment in the lab was open access for interested students and faculty. 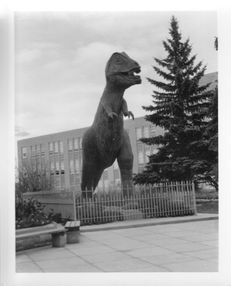 The lab was newly opened with my arrival in 1964 as a freshmen. The 3D tic tac toe program showed up one day as an executable card-deck, likely provided by a visiting IBM Customer Engineer. There was neither source code nor author identification. Once loaded via the card reader, play instructions were typed out on the console typewriter, first mover was selected via a console panel toggle switch, and moves were entered or output on the console typewriter as 3 digit (1-4) xyz coordinates of a 4x4x4 playing cube. The program did not learn from successive games, but had a fixed algorithm with a clever strategy for winning that was difficult to beat or draw. After a few months of playing with it, we decided to build a 4D version of the program. I proceeded to reverse-engineer the machine code to discover the design. The program strategy was to attempt construction of (and defend against) a two-way trap, including forcing the player to move so the trap could be established. A two-way trap can be established in any 4x4 plane through the 3D or 4D cube and is a move which simultaneously establishes 3-in-a-row threats in two intersecting rows. The 3D program strongly favored machine-side initial moves along the four major diagonals of the cube, with each such move being within the most (7) 4-entry rows. My friend then re-coded the game in assembly with modifications for 4D - a fourth move coordinate and favoring the eight major diagonals through the 4D cube (such moves being within the most (15) 4-entry rows). The 4D game was a bust, since it was trivial for the first mover (player or machine) to force a win. But I had the 3D game design that I later ported to a Philco 211 in 1968 while a grad student at the University of Wyoming, and then again to the OTHER-1. I've always wondered who wrote the original program that has provided me with hours of programming entertainment. 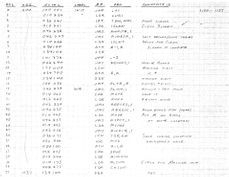 During Christmas season 2013, I did some Google searches and found a suspiciously familiar 3D tic-tac-toe FORTRAN program in an IBM 1620 archive, written by BOB LOUDEN in 1962. From a cursory look, the program has many characteristics in common with the machine code I reverse engineered, such as a table of all 76 4-entry rows, a table of the four major diagonals, computed sums of weighted player and machine moves along each row, several sets of snarky comments with which to needle the player during a game, and in particular, a FORTRAN switched GOTO statement (line TTT 0079: "14 GO TO (71,72,73,74,75,75,74,75,74),J") containing nine strategy processing choices based on a strategy level (J), and activated by a row sum matching the sum at index J in the 9-entry table NTEST (at data lines TTT 0137 - TTT 0145). However, the machine code I reverse engineered appears to be a later version, probably a rewrite in Assembly. In the machine code the 64 positions in 76 rows are numbered 0 to 63 (e.g. 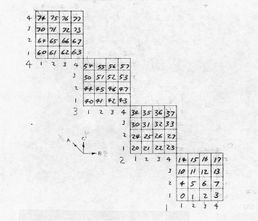 "00" numeric field at address 01239 in list of 76 rows at left) while they are explicitly numbered 1 to 64 in the FORTRAN code as formatted card data. Also, the machine code lists 10 machine or player sums in in it's "strategy table" (starting at address 01809 at right: 04 15 03 10 05 00 02 01 00 05), while the corresponding FORTRAN switched GOTO lists only nine such sums in the driving table NTEST (04 15 03 10 05 00 02 01 05). And the messages output during play by the programs are similar but do not exactly match. Thank you Mr. Louden, wherever you are! I had intended to include a pseudo assembly code listing of the 3D Tic Tac Toe game written for the Other-1.But as described on the Other-1 Instruction Set Details page, my assembly coding was just a convenient means for manually writing the machine code (sample page of 3D Tic Tac Toe to left) - code for a one-of-a-kind decommissioned machine. Similarly, the IBM 1620 machine code and Philco 211 assembly code listings I have are for obsolete and generally unavailable machines. 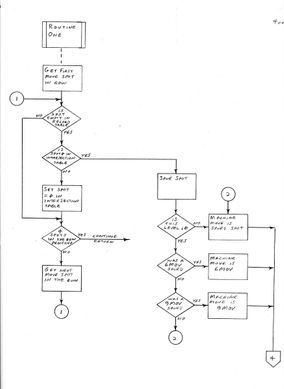 So, the game algorithm in flowchart form is presented below. Move-spot: A unique number 00-63 (00 - 77 base 8) assigned to each of the 64 possible positions on the 3D tic tac toe 4x4x4 playing cube. (See figure on right for assignments in base 8.) These assignments are used in the program implementation to index into the move position related Record Table & Intersection Table. where tier (x), row (y), and column (z) coordinates are in range 1 through 4. Note: Base 8 was used in program design and documentation for convenience in implementing on the OTHER-1. Record Table: A 64-entry table indexed by move-spot, used to keep a record of moves made by Player and Machine. All entries are initialized to 0 at game start. An entry value of 1 indicates a Player move at the move-spot, while a value of 5 indicates a Machine move at the move-spot. This table is used to determine whether a move-spot is occupied by a move, and to calculate the total value of moves in any row. Major Diagonal List: A list of move-spots along the 4 major cube diagonals, from which is chosen the first few machine moves. In base 10 these are: 0 21 42 63 3 22 41 60 12 25 38 51 15 26 37 48. In base 8 these are: 0 25 52 77 3 26 51 74 14 31 46 63 17 32 45 60. 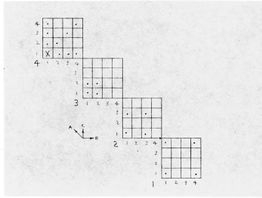 Rows List: A list of the 76 rows (paths) through the 4x4x4 playing cube, each row consisting of 4 move-spots, numbered as illustrated above. For processing convenience, the move spots of each row can be listed in the order of processing (see Notes on Subordinate routines, below). The left-hand 1620 listing portion above is a list of 75 of the rows in base 10 (the 76th row is on the top of the right 1620 listing portion). In the 1620 listing, the center move-spots of a row are listed first, followed by the outside move-spots. The order of the rows in the list is not important. 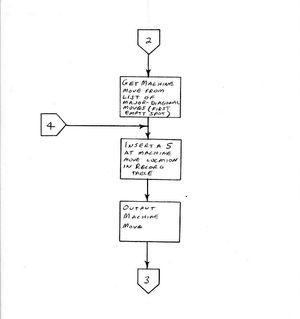 Variables 6MOV and 9MOV: Candidate Machine moves which may have been determined at program Levels 6 and/or 9 are saved in these variables until program Level 10, where one will be used in lieu of the move otherwise determined at Level 10. These variables are initialized to null (no-move) before Level 1 processing. Sums Table: A 76-entry table indexed by row number of the Rows List.. Each entry is the sum of any Player and Machine values for occupied move-spots in the Record Table for the referencing Row. The following figures show representative (but not the only) move configurations in any cube plane (of 18 interdependent planes), and how they would be processed at each program level to produce the next machine move. By "representative" I mean there are many ways, for example, to get 4 in a row in Level 1, or arrange two-way-traps in Level 4, but all are detected by the algorithms. Note that processing at higher levels 11, 10, and 6 work to produce the winning situation at level 5, and that winning moves/strategies at levels 2, 4, 5, 6 have corresponding defensive counter-moves at levels 3, 7, 8, 9. Action/Objective: If any row has 4 Player moves, the Machine loses - output "I lose"
Action/Objective: If any row has only 3 Machine moves, the Machine wins - output winning move and "I win"
Action/Objective: If there are two intersecting rows with 2 machine moves in each, Machine moves at intersection to make 2-way trap. This is the first level to make use of the Intersection table initialized prior to level 1. The "subordinate routine 1" inspects all rows containing exactly two machine moves, and records the open locations of such rows in the Intersection table (indicated in gray on diagram example). If the routine 1 detects a common intersection location (dark gray in example) for two such rows, this becomes the response machine move (red M) - establishing a winning two way trap. Otherwise, the routine continues to inspect and mark empty locations in 2-machine-moves-only rows till all are processed, and the next Level is entered. 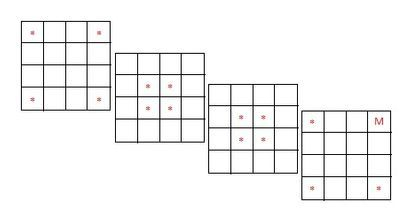 Action/Objective: (Empty move-spots in 2-machine-moves rows are still marked from Level 4.) If 2 intersects are found in a 05 sums row, move to second intersect spot: will setup 3 in row for player to block, next machine move can make 2-way trap. Action/Objective: Find move to set up forced two-way trap - save in "6MOV" for Level 10. Empty move-spots in 2-machine move rows are still marked for intersect from Level 4. 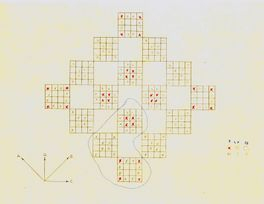 If an empty row intersects with empty squares of two rows each containing 2 machine moves, "subordinate routine 3" saves (for Level 10) this machine move to first non-intersection square in row, setting up the situation seen in in Level 5 (if not subsequently blocked by player). In this example the third column is processed from the bottom, center squares first. Subordinate routine 3 inspects all empty rows for for such moves, each saved move overwriting any which were previously found during this inspection. Action/Objective: Move to block attempt by Player to make two-way trap. Similar to Level 4, except machine moves to block Player. Also similar to Level 4, subordinate routine 1 records empty locations in 2-player-moves-in-a-rows in the Intersection table for reference in following Levels. Action/Objective: Move to block Player attempt to set up forced two-way trap. (Empty move-spots in 2-machine move rows are still marked for intersect from Level 7.) Similar to level 5, except move blocks: If 2 intersects are found in 01 sums row, the machine move to the second intersect spot will block a 3-in-row forcing of a two-way trap by player. Action/Objective: Find move to block Player attempt to set up forced two-way trap - save in 9MOV for Level 10. (Empty move-spots in 2-machine move rows are still marked for intersect from Level 7.) If an empty row intersects with empty squares of two rows each containing 2 player moves, move to first intersection square in row, setting up the situation seen in in Level 5 (if not blocked by player). In this example the third column is processed from the bottom, center squares first. Again, subordinate routine 3 actually saves only the last such move found, overwriting any previous ones found. Action/Objective: Find a move at intersection of 2 rows containing one machine move each, and hold if found. Then along with any previously found move, select the one to make in the order: 6MOV, 9MOV, held move. In this example the horizontal and vertical row intersection table entries are first set for the upper move, then as the bottom horizontal row is scanned/set for intersections of the corner move, the intersection for the upper move is found, and becomes the new move (there being no saved move6 or move9 moves). This example situation may occur frequently in early moves of games on diagonal planes, where both corner and center move-spots are on major diagonals through the cube. Action/Objective: No moves were found to build on: Machine moves to a random empty spot on the major diagonals (marked with asterisks). This typically happens (at least) for the first two or three machine moves. In the 1620 implementation, the game ends if the machine cannot obtain an empty major diagonal location for a move when it reaches this level. What? 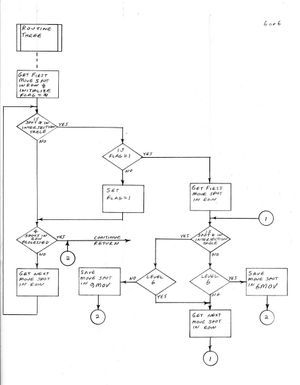 Flowcharts!?! 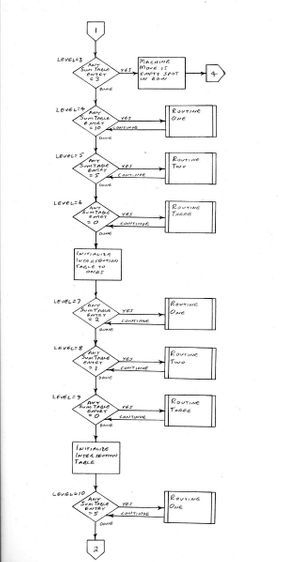 Yep - this was the software documentation approach on Air Force contracts in the mid 1970s, and so was mine too at the time. 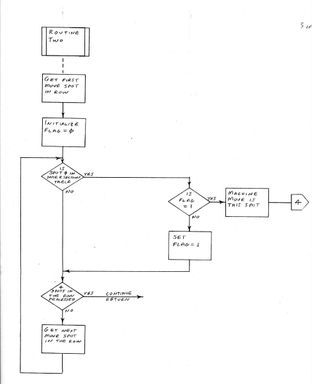 I constructed these flowcharts by revisiting the 1620 machine code and messy derived flowcharts, and my Philco 211 port (written in "TAC" Assembly), and then used these to do the OTHER-1 port. The intent was to preserve the game strategy algorithms of the 1620 code. An aside: These charts do not address the specifics of game display on the OTHER-1, which was done to a "TV Typewriter" - a black/white video text output interface, once available in kit form from South West Technical Products, which accepted ASCII character codes via interface through the Other-1 I/O Buss and output them to a connected TV set for display as 16 lines of 32 characters/line, with cursor control and basic character edit capability. The game board was first drawn with symbols !, +, and -, and machine "M" and player "P" moves added as play progressed via keyboard input. The figure to right shows teletype output of similar format. Each of the Level decision diamonds on Sheet 2 (above right) showing the "continue" return lines is shorthand to indicate a single loop through the entire 76 rows of the game cube for that Level, each row of 4 entries processed by the associated Subordinate routine (One, Two, or Three). The Subordinate routine will either continue to process the next row of 4 entries, or will exit the rows loop processing for the Level with a machine move to output (at entry point 4, Sheet 3, to left). 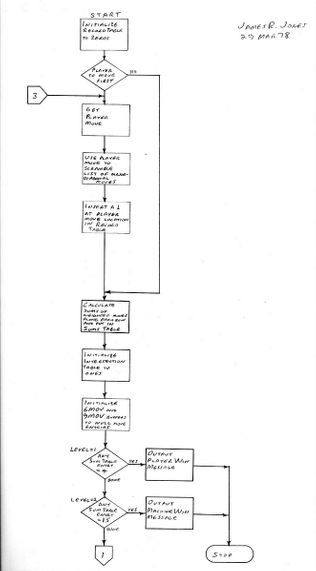 In order to verify the descriptions and example figures of the 3D tic tac toe algorithm section above, I built a Java program from the presented flowcharts and the shown 1620 list of rows, to run on Windows 7. Also I wanted to learn some Java and have some fun. I was interested in finding out how much of an edge the first mover has in the game if both players are using the implemented strategy, so I based moves at Level 11 (random machine move to an open major diagonal move) on a random number generator seeded once (msecs past start_1970) at the first new game after the application is started, and extended possible play till all board locations were taken (and Level 12: random machine move to any open location), possibly ending in a tie. An option is added to game management to provide for two copies (each separately started manually) of the application to play each other for multiple games, with moves coordinated through a common lock file, and with first-mover, second-mover, and tie totals maintained at each copy.